Remember when Oprah gave away a bunch of Pontiac G6s to her audience in 2004? I have often wondered what I would have done if I had been in that TV studio. Everyone else stood up and cheered, but I would have been like, "I can sell this, right?" That's exactly what one audience member did to finance her dreams. 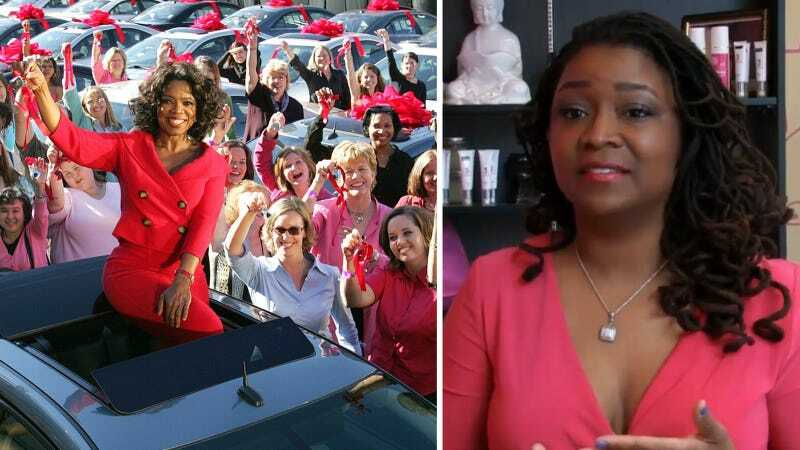 The Huffington Post has the scoop on Kiley Russell, who was in the audience that day and got the new car as a gift from Oprah. Not content with the joys (such as they are) of Pontiac G6 ownership, Russell instead sold that car and used the money to start her own business — a cosmetics company called Big Girl Cosmetics. Russell said that at the time, she needed a boost. The former assistant principal had recently been diagnosed with lupus and decided to do things a little differently in her life. So she sold the Pontiac and used the seed money to start her shop in Chicago. After success in retail, she decided to take things to the next level by attempting to get her line of cosmetics into Macy's stores. After two years of daily phone calls and relentless determination, she did it. The department store chain held launch parties in stores across the country to announce the new line. I say great job and congratulations, Ms. Russell. Success in business trumps owning a G6 any day of the week, and I'm sure it will have effects way beyond the life of that car.